Return to the world of The Witcher. The singleplayer RPG promises the exploration of "new and never-before-seen parts of The Witcher world" and will combine "narrative-driven exploration with unique puzzles and card battle mechanics." The game will follow Meve, "a war-veteran queen" who governs over the two Northern Realms, Lyria and Rivia. Of course, things are not peaceful, and Meve is forced to embark on a journey of "destruction and revenge." 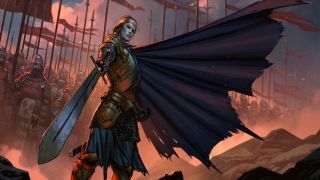 Thronebreaker will see players embarking on quests, gathering resources and going into battles powered by the skill-based battle system that will be familiar to players of Gwent: The Witcher Card Game, which isn’t at all surprising when you consider how the game began development. A return to the setting of The Witcher was hinted at a few months ago by CD Projekt Red’s CEO, Adam Kiciński and since then, Thronebreaker, originally planned as a singleplayer campaign for Gwent, has since evolved into a standalone RPG. Coinciding with the release, Gwent: The Witcher Card Game is leaving beta and also launching on PC on October 23.